Cruisers are such an American thing, we almost tend to raise an eyebrow when manufacturers from any other part of the world launch one. Especially Japan. The land of the rising sun is known better for its manic sportsbikes, dirt bikes and what not, and cruisers are perhaps the last form of the motorcycle you expect a bike maker like Kawasaki to offer. 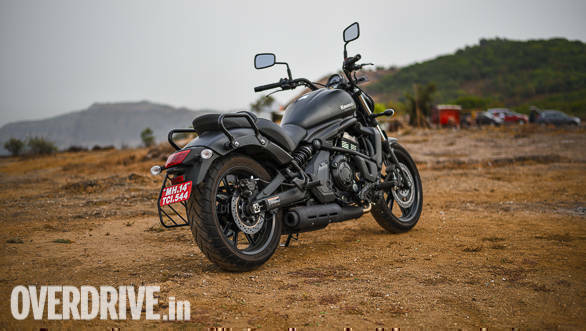 Kawasaki has had its Vulcan series of cruiser on sale internationally for really long now though and has brought its Vulcan S to our shores. 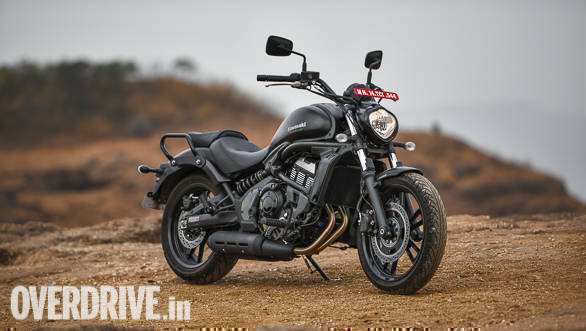 What's even more interesting is that the Vulcan S is powered by the same engine as the Kawasaki Ninja 650 and promises to bring the levels of precision, finesse and refinement that Kawasaki is known for, to the middleweight cruiser space. Well, it features ABS as standard as well, which should address the concerns of many on the safety front. So has the cat been set amongst the pigeons with the launch of the Kawasaki Vulcan S? It wouldn't be wrong to say the Kawasaki Vulcan S breaks stereotypes. We're used to seeing cruisers as chrome-laden, flashy looking motorcycles with old-school designs, but the Vulcan S is quite the antithesis. Its design is unconventional and the bike wears a matte-black finish from end to end which makes for a distinctive appearance. Proportions are generous for a middleweight cruiser, especially the fuel tank which looks big when sitting on the bike though it appears a lot sleeker from the sides. The frame is exposed and also gets a matte black finish, while the engine gets a machined finish, making for a nice contrast to the matte black. I really liked the design of the alloys as they feature webbings between the spokes and look unique. The single pod instrument cluster is straight off the ER-6n and looks functional, while offering good amounts of information. The offset monoshock looks nice, but the Vulcan's rear half isn't as appealing as the front. The horizontally mounted exhaust looks odd, the rear fender and tail lamp look too plain and the Vulcan does not even get an LED stop light. Kawasaki India has bolted on a pair of pillion grab handles to meet regulations along with a saree guard but both are too large in size, making them an eyesore, and the welds on the grab handles are not clean either. The Vulcan S is powered by the same 649cc, liquid-cooled parallel-twin engine that powered the last generation Ninja 650. The motor has been detuned to offer 61PS and 63Nm though the power and torque curve has been altered to improve bottom end and midrange grunt. The result? Despite being a cruiser, the Vulcan S has no trouble rearing its head! The engine does not get ride-by-wire like the new Ninja 650 and fueling is slightly jerky a low revs, though the engine itself is as smooth as ever. 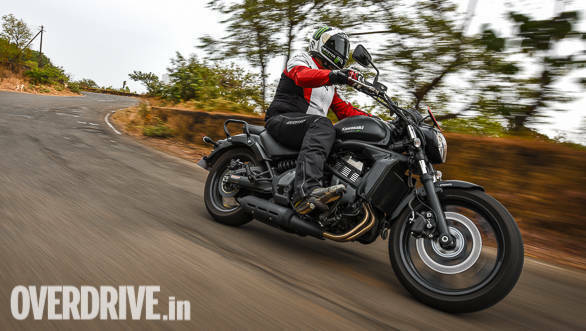 The Vulcan S feels quick and clocked a 0-100kmph time of 6.37 seconds in our VBOX tests, which is reasonably quick for a 235kg, 61PS motorcycle. 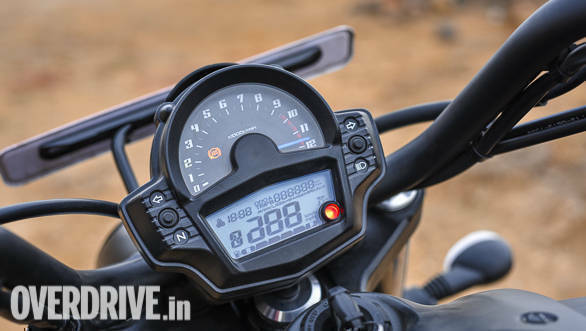 More importantly, the six-speed transmission's ratios allowed me to ride the bike in fourth at 45kmph in traffic comfortably, which speaks a lot about the tractability. 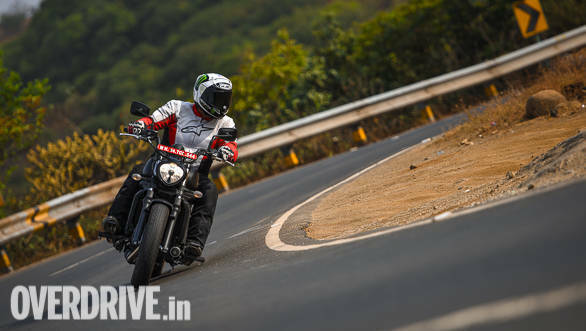 Fuel efficiency is impressive too  the Vulcan S returned 18kmpl in city and 24.3kmpl on the highway. The Vulcan's gearbox belongs to the Ninja 650 as well and feels precise, even offering smooth clutchless upshifts. The Vulcan S does not get a slipper clutch, which could be unsettling for inexperienced riders. Ratios are adequate for most conditions and cruising at a steady 130kmph is a cinch, making the Vulcan S a capable highway tool. On the whole the powertrain is impressive in terms of refinement and performance, though one shortcoming is the lack of a throaty exhaust note, which could be disappointing to cruiser fans. A comfortable seating position is an important part of the cruiser experience and the Vulcan S does not disappoint. With a saddle height of just 705mm the Kawasaki is easy to swing a leg over. The handlebar-seat-footpeg combination makes for a comfortable posture but the handlebars are angled a little too inwards, which makes opening the throttle fully a little awkward. Footpegs are adjustable and can be moved forward or backward by an inch though you will need to buy linkage rods for the gear shifter separately. The stepped seat supports the tailbone well but cushioning could have been slightly softer. The pillion seat is more of a cosmetic addition and isn't very comfortable, unless you are really slim.Ride quality is impressive as the Vulcan S absorbs bumps and potholes very well without the jarring effect seen on several cruisers with low suspension travel. This makes it comfortable on bad roads and mid corner bumps are handled well too. The suspension also makes for a planted feel at speeds, contributing to the bike's stability. Front forks are not adjustable but preload on the rear monoshock can be adjusted. 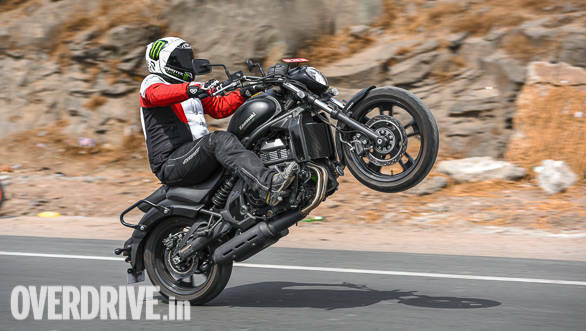 The chassis makes for a nimble feel when cutting through traffic or carving corners, despite the weight.The Vulcan's 18-inch front and 17-inch rear wheel setup works well and the bike is quick to tip into corners but a chink in its armour are the low set footpegs and 130mm ground clearance. The chassis holds more potential than what the footpegs allow which is a bit disappointing, as grinding the pegs around corners is too easy. The low clearance also means the Vulcan S scrapes its underside over speed breakers. The Dunlop Sportmax tyres is comes shod with offer decent grip on most occasions but lack adequate grip when braking hard, which, coupled with the lack of adequate feel from the front end robs you of confidence. This is impressive for a cruiser and the Vulcan S clearly showcases its Kawasaki genes in the ride and handling department. The Vulcan S comes across as a likeable, friendly motorcycle. 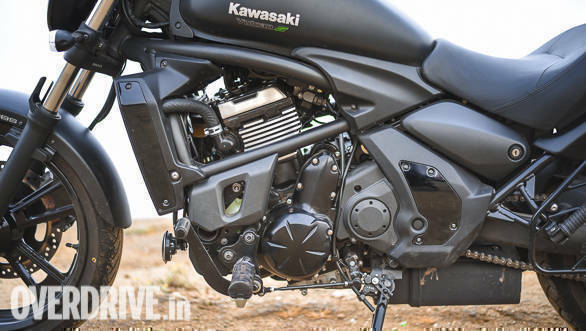 It impresses with its ride, handling and performance, living up to the Kawasaki name. There are a few misses like ride-by-wire and slipper clutch but those don't come in the way of an affable riding experience. The bike retails at Rs 5.44 lakh ex-showroom Mumbai, which is a bit of a premium and a lower price tag should help it attract audiences better. 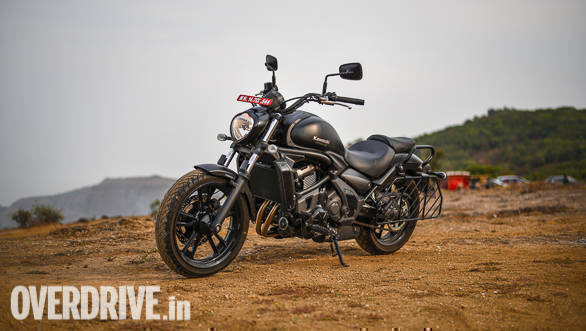 The Harley-Davidson Street 750 retails at Rs 5.25 lakh ex-showroom, while the sportier Street Rod retails at Rs 6.45 lakh, which makes them direct rivals for the Kawasaki. The Vulcan S brings with it the promise of Japanese reliability and precision, but as a cruiser brand Kawasaki isn't really popular when compared to Harley-Davidson, which could be a bit of a stumbling block for the Vulcan S.